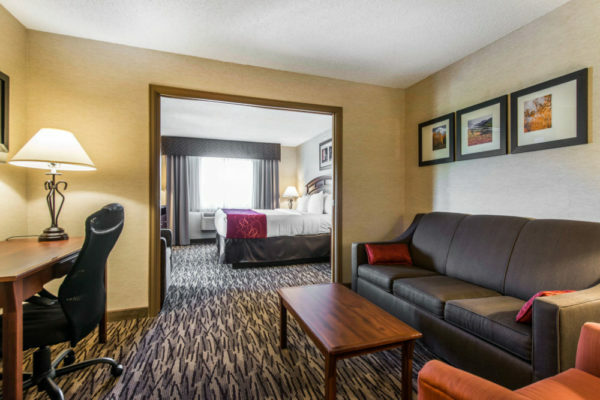 Located in stunning Evergreen, Colorado, just minutes away from downtown Denver, Comfort Suites Golden West on Evergreen Parkway is a family friendly, all-suites hotel offering spacious accommodations and top hotel features surrounded by views of the majestic Rocky Mountains. With a central location just minutes away from popular area attractions, skiing, historic landmarks, breweries, pro sports, museums, exciting outdoor activities, and downtown Denver, Comfort Suites Golden West on Evergreen Parkway offers a superior hotel experience with unique architectural features, comfortable hotel accommodations, spacious suites, deluxe hotel amenities, free internet access, complimentary breakfast, a refreshing indoor swimming pool, and fabulous vacation packages for travel to historic Denver, Colorado. 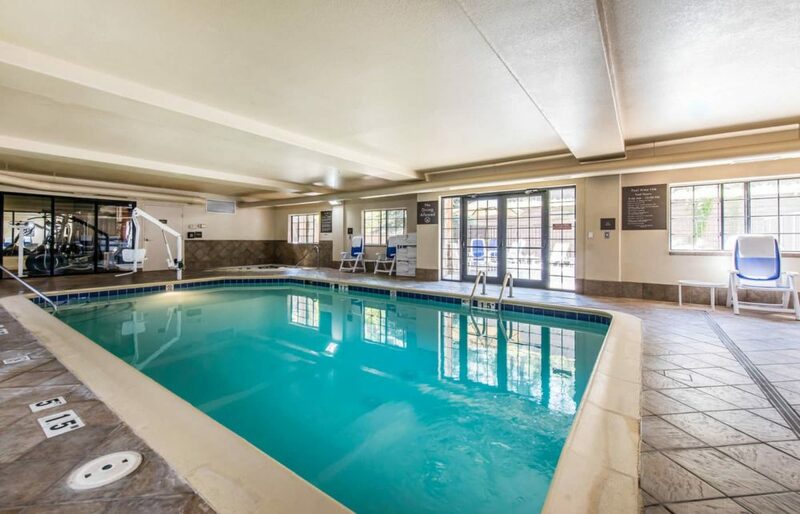 Click here to see our full list of amenities. Furthermore, Comfort Suites Golden West is located just west of Denver south of Golden and closeby to Red Rocks Park and Amphitheatre. Additionally, we have Golf Courses , Breweries and a bunch of other places nearby to check out. Come and visit us today while you’re looking for a place to stay; we guarantee that you wont be disappointed. Host your business meeting with us! 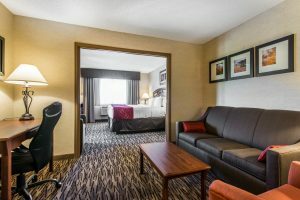 We just returned home to the East Coast from Colorado and I must say the Comfort Suites Golden West in Evergreen Colorado is one of the BEST five night stays we've ever had. 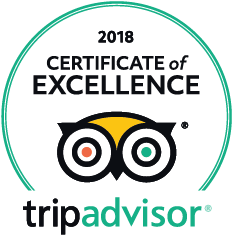 From it's beautiful decor and setting in tree lined rolling hills flanked by mountains to the bountiful breakfast buffet; clean well equipped rooms, and friendly (above and beyond) service...This place is top notch folks!! I know we WILL BE BACK!!! We reserved several rooms for our wedding block and everyone had a wonderful experience. The rooms were clean and very nice. The bathrooms looked recently renovated and in excellent condition. The staff was wonderful - friendly and very accommodating. I recommend this hotel for anyone who is looking for a quality place to stay with outstanding views and a convenient location! The location is beautiful and the interior was just as lovely. The food choices were nice, providing enough variety to accommodate vegetarians and gluten free members of our family. The kids were super excited to enjoy some fresh baked cookies one of the nights were there. The sauna was a plus...we have never been to a hotel offering this service. We felt spoiled! "My husband and I returned to the Comfort Suites Golden West for out first wedding anniversary after having our wedding guests stay there. We purchased their "Romance Package" and had a very romantic, memorable anniversary stay there. Upon arrival, the friendly front desk agent told us that everything was ready in our room. When we opened the door to our room, rose petals were on the floor with a bouquet of flowers, champagne glasses, and an envelope with our name on it. Inside the envelope was a letter written to us from the staff wishing us an happy anniversary with our dinner vouchers at Mount Vernon Country Club. Dinner was excellent and there was even an entertainer singing and playing the piano while we were there. I had steak and lobster, my husband had prime rub. Both were delicious. When we came back from dinner we enjoyed the private Jacuzzi and champagne that the hotel staff had so thoughtfully left in the refrigerator for us. It was an anniversary for the books! Very pleased with the Comfort Suites Evergreen! I stayed at the hotel for my daughter’s wedding. Much of the groom’s family stayed at the hotel also. The staff was more than willing to help us distribute gift bags to a number of guests as they checked in. They were also very accommodating in allowing me to check in early since I notified them in advance. We enjoyed having a block of rooms available for our family during wedding week! It was awesome! We stayed here as part of a wedding party and were very surprised at how nice the accommodations were. Much more than we expected. I found everything to be wonderful at the Comfort Suites in Evergreen. The staff was exceptional and very helpful and made me and my family’s stay the best that it could be. My daughter was married in Evergreen and the staff made it so easy to accommodate our guests and us. I came to Evergreen for a friend’s wedding. My friend booked a block of rooms for a wedding price. I was extremely satisfied and will stay there when we go to visit in the future. I will also highly recommend this hotel. Very convenient location and beautiful view! We had two of our children married in Evergreen over the last few years, and at each wedding, we had a block of rooms along with the wedding party. We have always enjoyed our stays and will definitely be back. 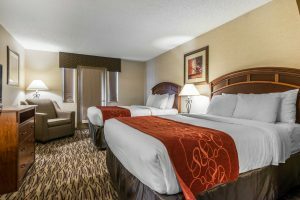 Evergreen, Colorado lodge style hotel accommodations with pet friendly rooms near Denver and Golden Area attractions!